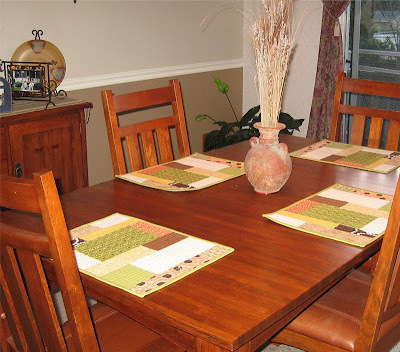 A Quilter's Table: Show Off! Just thought you'd enjoy a quick peek of the Color Block Placemats I made my coworker - on her dining table! Don't they look great in real life? They look lovely, great colour choices against the wood table. Bet she was pleased! They do look great, love the picture, and it is always nice to see them in use! You should show off! They look absolutely perfect in that room. Those look so great, Debbie! And I love your friend's table and chairs! They look wonderful on her lovely table! They look fab, well done! They are nice! And they go so well with the decor. Isn't it nice to make something that is beautiful and practical? Lovely mats! They look perfect in your room! They look amazing in her dining room. Definately bookmarking that pattern to make up one day. Are you also an interior designer? Those placemats looks like they belong in that room. :) Wonderful job as always. These look great! I have certainly seen other placemats done, but none have ever made me think, hmm, I might want to make one of those! I love what you've done! Nice job.